Well it’s been a little while since making a post. 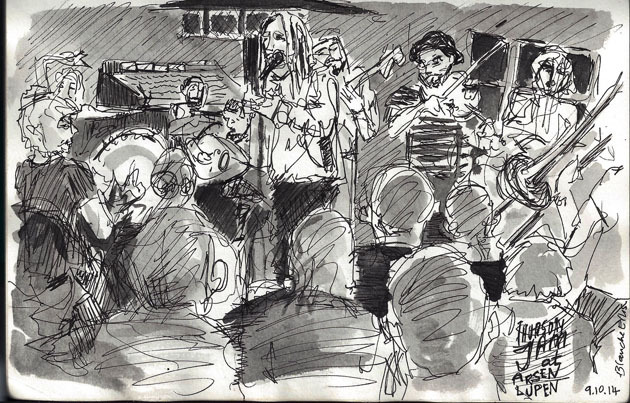 Largely because I’ve been busy making music which has resulted in lots of drawings of musicians and talented friends who I’ve seen or shared stages with throughout the summer…… I have just finished a sketchbook between August and October and thought I would share some images. I also had a wonderful trip to Istanbul in October, a city I would like to re-visit for longer, and have a collection of sketches from there – about half of which come from a fun and whiskey fulled night spent in a lovely little hideaway bar which we found 4 floors up, in a two man lift, from the back of an old hotel, down a side street – and where we found a beautiful jam. Always music. Some of the music I have been making can be found via the links below…. naturally I have been unable to sketch myself in the act so recordings and videos will have to suffice ! Overground sketch and track list for recording session.